Update, 3/1/2017: The two PricewaterhouseCoopers accountants behind the best picture mishap will not work for the Oscars again, the Associated Press reports. In a statement emailed from PwC to the NewsHour, the company confirmed the AP report, and that Cullinan and Ruiz will remain partners with the firm. Update, 2/27/2017: The envelope mishap was due to a “human error,” Tim Ryan, U.S. chairman and senior partner of PwC told USA TODAY on Monday. According to the Wall Street Journal, Cullinan tweeted a photo of best actress winner Emma Stone backstage just minutes before he handed over the wrong envelope. That tweet has now been deleted. Beatty later said he had been given a card that said “Emma Stone, La La Land” — a duplicate of the card used earlier to announce best actress. Confused, he and co-presenter Faye Dunaway announced “La La Land” the winner. “Accountants are supposed to set up systems that don’t fail,” he said. The system behind the Oscars envelopes is an intense and secretive one. In an Academy blogpost on Medium earlier this month, PwC shed some light on the process. It begins with the counting of the Oscars ballots, which come in from more than 6,000 Academy members. The ballots can be cast on paper or online, but the counting happens all on paper, a task divided among multiple PwC team members so no one can know the actual total. No one, that is, except PwC lead partners Martha L. Ruiz and Brian Cullinan. They were the two people tasked with overseeing this year’s process — from physically putting the winning cards in the envelopes to safeguarding them in briefcases until they were given to the Oscar presenter. Ruiz and Cullinan have both performed the task before. Ruiz and Cullinan also said they memorize all the winners, so names do not need to be written down again. “We check things dozens of times, recounts and double-checks,” Cullinan wrote in the blog post. On the big night, Ruiz and Cullinan travel to the show with their envelopes in briefcases, riding in separate cars and on separate routes, according to the BBC. But what’s perhaps most interesting is, for security purposes, both briefcases contain two copies of every envelope — which explains how there could have been two sets of the best actress cards Sunday night. Last week, in a Huffington Post piece that explored what would happen if a wrong name was read at the Oscars, Ruiz insisted there were stringent checks in place to make sure that didn’t happen. “It’s him checking me and me checking him, and we do it multiple times against each other to make sure that when we leave and are ultimately handing the envelopes to someone, we’re very confident they’re getting the right envelopes and the contents in them are accurate,” she said. In that piece, Cullinan and Ruiz also said if a presenter ever declared a false winner, they would alert the nearest stage manager, who would then inform the show’s producers. On Sunday night, that communication process took a long time, with three producers of “La La Land” making acceptance speeches before the error was corrected. 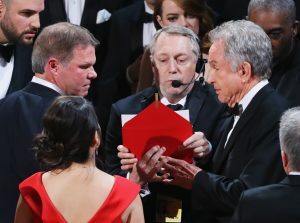 After people with headsets came on stage, along with Cullinan, to check the envelopes, it was “La La Land” producer Jordan Horowitz who ultimately made the announcement that his film had not won. The implications for PwC could be serious and long-lasting, Gordon says, though he added the caveat that changing accountants was expensive; the biggest hit to the company could be its ability to attract new business. For now, it’s dealing with Sunday’s fallout. On Monday, there were reports that PwC executives were seen in crisis meetings, as critical comments rolled in online, mostly variants on the theme that the accounting firm had just one job to do. PwC’s work on the next year’s Oscars typically begins in March. Left: look on during the mishap over envelopes at the 89th Academy Awards. Credit: REUTERS/Lucy Nicholson.